The message missionaries share with people about Heavenly Father’s plan for us has always been the same. Enoch was a prophet before Jesus was born on earth. The Lord asked him to share the gospel, as missionaries do today. Color the picture of Enoch. Then draw missionary clothing on Tanner to show what missionaries look like today. Helps for Parents: Explain that Enoch was asked to share the gospel. He didn’t think he could because he thought he didn’t know enough. The Lord told Enoch that he could do anything with the Lord’s help. Because Enoch was obedient, the Lord blessed him to be able to teach the people. (See Moses 6:31–38.) Ask your children what they can do now to be good missionaries like Enoch. Helps for Parents: Explain that even though Tanner has not yet been called to serve a full-time mission, he can still do missionary work while he is young. 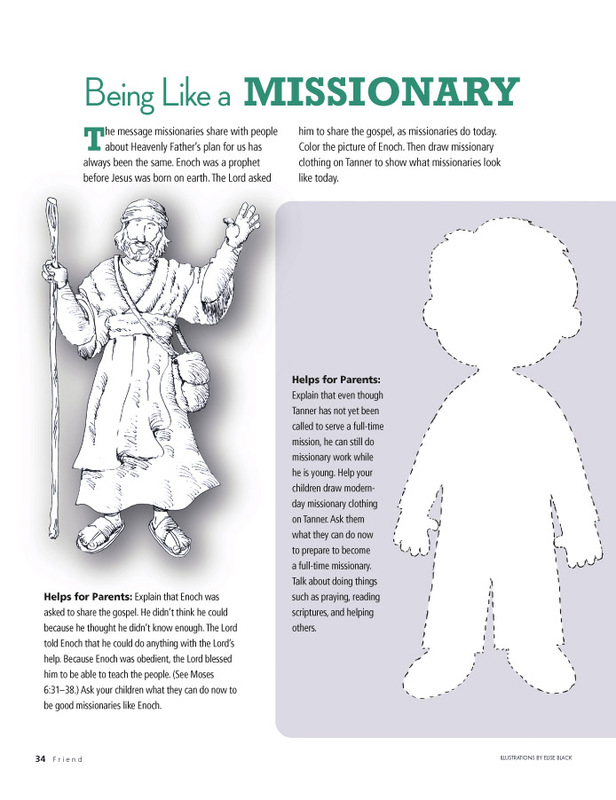 Help your children draw modern-day missionary clothing on Tanner. Ask them what they can do now to prepare to become a full-time missionary. Talk about doing things such as praying, reading scriptures, and helping others.